The South African economy has gone into recession for the first time since 1992, following a sharp slowdown in the manufacturing and mining sectors. Africa's biggest economy contracted at an annualised rate of 6.4% between January and March, compared with the same period a year earlier. It was the biggest decline since 1984 and followed an annualised 1.8% fall in the previous three months. The construction sector, however, was boosted by the upcoming World Cup. 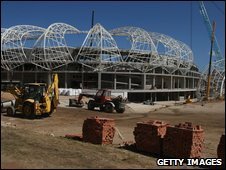 South Africa is benefiting from a huge programme of government investment ahead of the football tournament in 2010. A recession is generally defined as being two quarters of negative growth. "It's far worse than we expected," said Elna Moolman, economist at Barnard Jacobs Mellet. "It confirms the recession in the economy and certainly increases concerns about overall growth for 2009, given such a bad start for the year." The Reserve Bank of South Africa is due to announce its latest decision on interest rates on Thursday. It is now expected to cut rates by a full percentage point from the current level of 8.5%. It has started holding its meetings every month instead of every other month to allow it to act more quickly. The central bank has reduced rates from a level of 12% in December. Statistics South Africa, which calculated the latest figures, said the slowdown in manufacturing and the mining and quarrying sector had been primarily responsible for the contraction. Mining firms have been hit by falling demand for their products as a result of the global economic slowdown. The government has predicted that there will be another quarter of negative growth to come before the economy recovers. "Looking ahead, we expect another quarterly contraction for the second quarter, but this is expected to be smaller," said National Treasury Director General Lesetja Kganyago. The weak economy presents particular problems for the new President Jacob Zuma, who has promised to create jobs and fight poverty. "It's easy to budget and make plans in a boom phase," said Johan Rossouw, chief economist at Vector Securities and Derivatives. "Now it's a different kettle of fish. It is definitely going to make things tougher."